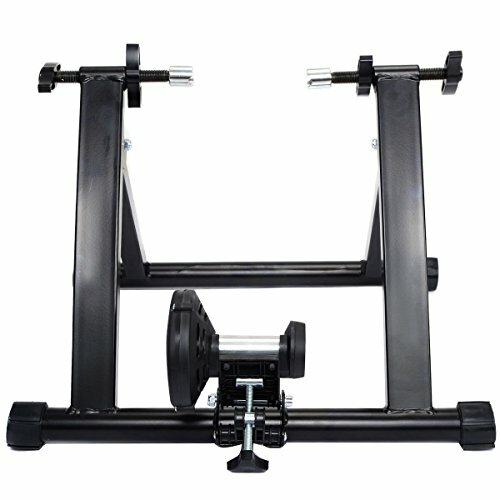 【Solid Construction】Heavy duty steel frame , the extra wide and heavy duty frame makes the bike trainer more stable and quality, which can support 330 lbs. 【Noise Reduction】Smooth, quiet Magnetic resistance, maximum the noise reduction, it will not make you feel scrambled. 【Suitable For Most Bikes】Can hook up to most bikes, fitting 26-28 inches or 700C bike wheels with quick release. 【Easy To Carry】The weight is about 15.5 Lbs, and this bicycle trainer could be folded, portable and can be folded easily for travel and storage. 【Quiet Operation】Fixed device, easy to install and remove. Turn your bike into an indoor exercise bike, easy set-up and quiet operation.